The first step to see useful SPAN output in a network analyzer (like Wireshark) begins with a packet capture. In a network with Cisco switches, that means configuring a Switched Port Analyzer (SPAN) session to direct the to-be-captured messages to the analyzer. This next lab gives you some basic requirements, with a common over-arching requirement: collect all the messages that matter, while avoiding gathering too many messages. Configure local SPAN on switch SW1 in the figure. Note that with SPAN it is difficult to capture exactly the subset of messages you want to capture. So, you have two goals: a primary goal that defines all the messages that you must capture, and secondary goal of capturing as few extra messages beyond those requested as part of the primary goal. The secondary goal: capture as few extra frames as possible, which then requires less filtering on the network analyzer to then show all the messages sent between PC1 and PC2. All devices use IP addresses in subnet 172.16.2.0/24, with the last octet of each respective address shown in the figure near the device. 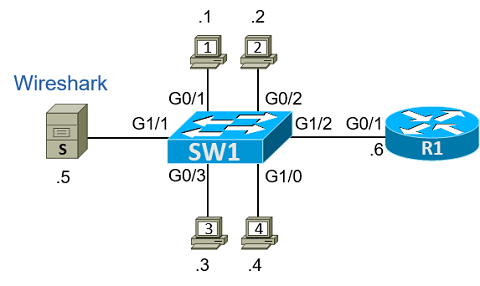 Example 1 shows the initial configuration on switch SW1. To answer on paper, the process is of course simple: write your answer, and check it against the answer post that follows this post. 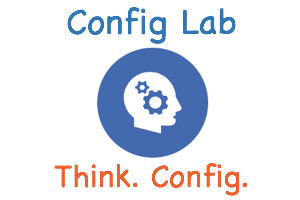 To test in lab, if you build this lab exercise in hardware, you will need to download and install a network analyzer on the computer that sits where the server sits in the figure. The process of how to do that is beyond the scope of this lab. However, if you start at www.wireshark.org and follow the instructions. VIRL does support the ability to capture packets, which allows you to then feed the packets into Wireshark running on your computer. Basically you tell VIRL on what interface to capture, and then direct VIRL where to send the packets. However, the specifics require several steps. So, I’ve left the rest of the details out of the blog post here, other than to mention that you can further research this feature on your own if you happen to use VIRL.